I overheard this line coming from the kitchen after I’d thrown together what I thought was a brilliant new concept for dinner. Seriously? How did I not catch on? Except we had company. And my husband and said company were in the process of making home brew, so they couldn’t leave. I got it! 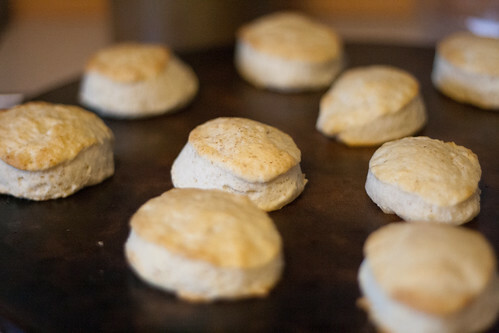 I’ll make biscuits. Those are fast and easy. Ok, what else? Tomato sauce! Perfect! Oh my gosh, we have ground beef! This is going to be so awesome! I get it now. Seriously, how did I not pick up on that? But they were delicious! And gourmet…or something. Sift dry ingredients together in a mixing bowl until well combined. Add oil and milk, and mix until all the ingredients are just incorporated. Don’t over mix. Turn the dough out on a floured surface, and roll out to about 1/4 inch thick–you don’t want it to be too thin. Using a round cutter (mason jar rings work really well), cut out circles and place onto a stone ware pan or lined cookie sheet. Bake for 10-12 minutes, until tops and bottoms are golden brown. Brown the meat in a skillet, draining the juices periodically. 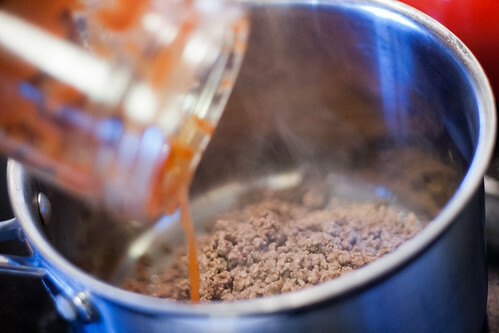 Add the sauce and heat through completely. 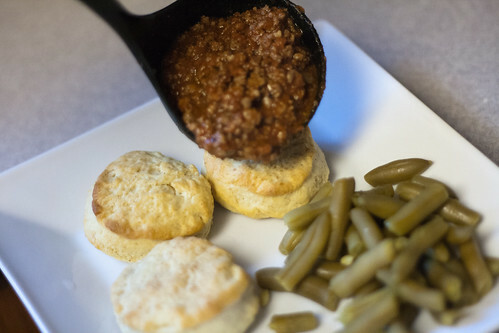 Serve the biscuits warm, covered in the meat sauce. And don’t tell anyone I made Sloppy Joes. It would ruin my street cred…or something. first – you should totally get your aunt’s chocolate sauce recipe, like now. 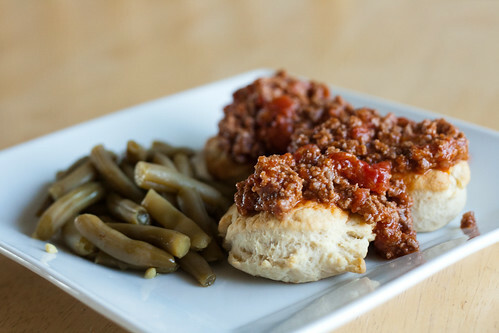 and second sloppy joe’s are SO much better when you make them yourself and not from a can! glad you (re)discovered them. great post. I’ll see if she’s willing to part with it! What a great impromptu dinner! I love it when I have nothing planned and scrounge around and come up with something delicious. I bet the guys were pleased as can be with this meal.